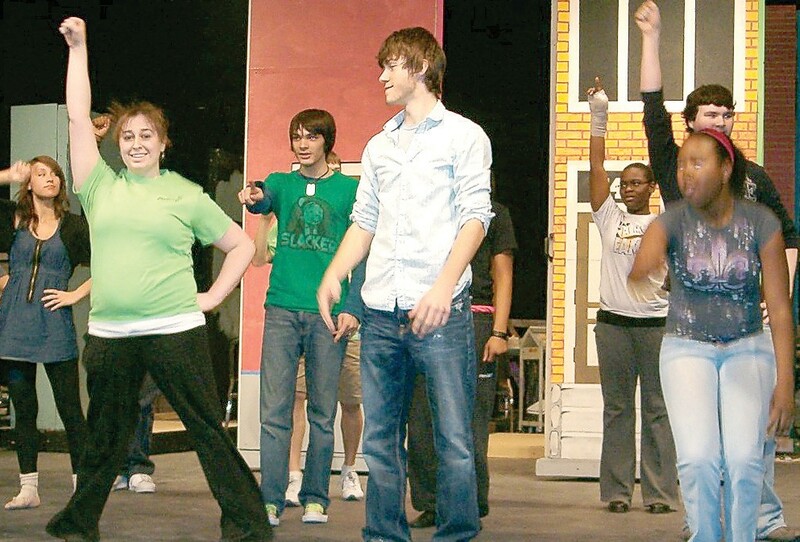 The cast of the Carman-Ainsworth High School production of the musical ”Hairspray” perform during rehearsals recently. FLINT TWP. — Eight days before opening night found the 52 cast members of the musical “Hairspray’’ gathered in the Carman-Ainsworth High School auditorium for another marathon after-school rehearsal. About 30 students were on stage practicing choreography, some were seated off-stage doing homework and a few were sprawled on the floor catnapping. “We’ve been having rehearsals every night except Sunday,’’ said CAHS theater director DeLynne Miller, adding as of Thursday the 2:30-7 p.m. rehearsal time will be extended two more hours. Dress rehearsals begin next week. “We will be working right up to the 11th hour,’’ Miller said. The 2:15-minute play itself runs four days — March 16-19 at 7 p.m. and March 20 at 3 p.m.
Miller said ticket pre-sales are going better than expected. They are $8 each or $6 each for groups of 15 or more, and will be sold at the door but Miller’s hoping for a sell-out. CAHS theater program has staged, Miller said of the nearly $3000 cost for production rights. Students fund-raised about $100 each to help pay for the play’s extensive 1960s-style wardrobing including 45 big-hair wigs. Then there’s set-building costs. Set circa 1962 in Baltimore, Maryland, the play’s central theme is about racial integration with subthemes about overcoming other prejudices. It chronicles the adventures of perky, chubby teen Tracy Turnblad (played by Paige Conway) as she topples racial barriers at a local teen dance show along with other biases. It has proved to be an eye-opener for students, Miller said. “We’re learning a lot about working together. It’s shocking for these kids to realize that … had they been in high school in 1962, the people they are best friends with would not have been best friends with them,’’ she said. Miller also strives to make it a fun learning experience for students. “It’s a ton of fun,’’ Miller said of the Broadway musical that won eight Tony Awards and was turned into a successful film. It opened on Broadway in August 2002 and closed in January 2009 after more than 2,500 performances. “The music is great. I think you can go away and have a good conversation about what the show is about. It’s not just funny. It creates good dialog.’’ Miller said. Miller thought theirs would be the first local high school staging of the musical but recently has learned of a production at Bentley High School this weekend. For ticket information, call 810-591- 3240 or go online to www.showtix4u.com.